A unique look at World War I in that the book is concerned with two significant powers lingering mainly on the sidelines of the conflict. Herman compares and contrasts Lenin and Woodrow Wilson's personalities and quests for power and isn't particularly kind to either of them. 1917 assumes you know all the terrible things Lenin did so he spends more time on the damage Wilson's presidency did to the international stage and how just a little bit of flexibility, or empathy, on his part could have helped set the world on a much different path then the destructive one it's been on ever since the first World War. 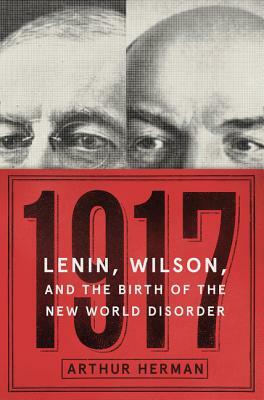 This is the story of two men, and the two decisions, that transformed world history in a single tumultuous year, 1917: Wilson’s entry into World War One and Lenin’s Bolshevik Revolution. In April 1917 Woodrow Wilson, champion of American democracy but also segregation; advocate for free trade and a new world order based on freedom and justice; thrust the United States into World War One in order to make the “world safe for democracy”—only to see his dreams for a liberal international system dissolve into chaos, bloodshed, and betrayal. That October Vladimir Lenin, communist revolutionary and advocate for class war and “dictatorship of the proletariat,” would overthrow Russia’s earlier democratic revolution that had toppled the all-power Czar, all in the name of liberating humanity—and instead would set up the most repressive totalitarian regime in history, the Soviet Union. In this incisive, fast-paced history, New York Times bestselling author Arthur Herman brilliantly reveals how Lenin and Wilson rewrote the rules of modern geopolitics. Through the end of World War I, countries only marched into war to increase or protect their national interests. After World War I, countries began going to war over ideas. Together Lenin and Wilson unleashed the disruptive ideologies that would sweep the world, from nationalism and globalism to Communism and terrorism, and that continue to shape our world today. Our New World Disorder is the legacy left by Wilson and Lenin, and their visions of the perfectibility of man. One hundred years later, we still sit on the powder keg they first set the detonator to, through war and revolution. Arthur Herman, PhD, is the author of the New York Times bestseller How the Scots Invented the Modern World, which has sold a half million copies worldwide, and Gandhi and Churchill, which was a 2009 finalist for the Pulitzer Prize. His six other books include To Rule the Waves: How the British Navy Shaped the Modern World, which was nominated for the UK’s prestigious Mountbatten Maritime Prize; Freedom’s Forge, named by the Economist as one of the Best Books of 2012; and Douglas MacArthur: American Warrior. He is currently a Senior Fellow at the Hudson Institute in Washington, DC.